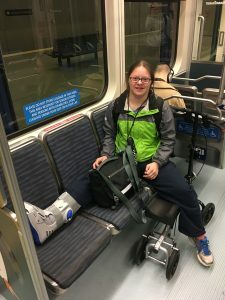 If you were to get a group of disabled people in a room and ask them about barriers to independent living, it wouldn’t take too long before you would hear about transportation. This means many things to disabled people. 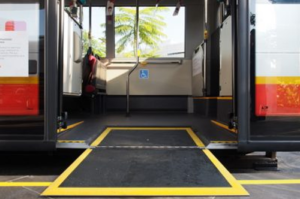 For some of us, it means regular public transit; others, paratransit or driving, but regardless of which form you use, it is rife with challenges – especially surrounding general access or accessibility issues like speaking bus stops or spaces for mobility devices. One area of transit access that I struggle with is hills. I moved from my hometown to one closer to friends and family at the end of last summer. Going into the move, I was aware that there was a steep hill going into my neighborhood. I decided the inconvenience was minor compared to the reward – less expensive and closer to loved ones. What I didn’t know was the amount of hills throughout my neighborhood. Every direction I go, there’s a hill. If I had known this, I may have thought it over before moving. The City of Seattle actually has a solution for hill haters like me called AccessMap. If only it was available in my town! Hills and all, I still moved. So, since moving is not a possibility at this time, I’ve learned to adapt. Unless it’s a day where I have access to a car, in order to leave the house, I have to take an Uber or Lyft the few blocks to a bus stop. As you can imagine, this gets pricey fast. An average of $8 a day to be precise. After about six weeks of this, someone, frustrated watching me waste money on Uber, suggested I apply for paratransit (called Metro Access in Seattle) to see if that would alleviate the problem. I couldn’t believe I hadn’t thought of it sooner. Like most services, this has an application process, and like most disability specific services, it is convoluted and maddening. If I were to design the application, I would eliminate a few parts from it and simplify the rest. For example, I wouldn’t require a screening just to obtain an actual application. The application itself wasn’t particularly frustrating as it asked the types of questions I’d expect; disabilities, challenges to using transit, examples of places you travel etc. After that is where things get really irritating. After a call, I personally deemed unnecessary, to confirm application information, you’ll be sent instructions regarding an in person evaluation. This is where things really begin to fall apart in my opinion. I’d expect the in person evaluation to cover examples of all the barriers and challenges a person has to riding transit, but, as far as I could tell from the instructions, it doesn’t. The instruction sheet mentioned ability to walk, navigate a curb cut, and get on and off a bus simulator. Where are the parts about uneven terrain, hills, or inclement weather? All of these things were highlighted in the application, and comprise the main barriers I have to bus riding right now, but they aren’t mentioned in the instructions for in person eval. Here’s the thing – for those who don’t know, Seattle has plenty of hills; particularly in the neighborhood surrounding the clinic. How hard is it to go outside and evaluate any barriers regarding hills? I understand inclement weather such as snow or ice cannot be appropriately evaluated because snow is a rarity here, but surely, uneven terrain or hills can be evaluated. After reading the paperwork, I decided I may as well just go to the eval and then appeal it when I was denied. Only, there is no appeals process, or, if there is, it was nowhere on their website or in their rider handbook. So, I did a little more digging. Riders like myself who typically use a regular bus, but have occasional barriers, are “conditionally eligible;” as in, as long as there’s a barrier and you have Metro Access services, you may use it. Fair enough. Until the caveat, because of course, there’s one coming! Metro Access will only provide enough service to remove the barrier, so in my case, take me to the bus stop. Here’s the problem with that. Even if I were to be deemed eligible, which you can see from above is a big if, I’d be expected to wait in their 30 minute window – to potentially be picked up on time, but likely early or late and be given a loose estimation of when the van would actually show, as I’ve consistently seen with a good friend who uses Access regularly, and then and only then, be able to travel as far as the regular bus stop down the hill? How am I supposed to plan a trip anywhere, get to an appointment, or even work, if I can’t guarantee Metro Access will come to pick me up when it’s supposed to, and then make the transfer(s) to a regular bus? All of the hassle and uncertainty isn’t really worth the few dollars I’d be saving, so I’m back to using Uber/Lyft to travel to the stop. Yes, it’s more expensive, but in return I get a guarantee of pick up time and can track the location of the vehicle. Upon hearing my complaints and experiences trying to navigate the process, my boyfriend came up with an idea. As he’s a data guy and uses public records in his work, why not obtain the public record of Metro Access users who are in a similar situation as me? So, he did. I am writing in response to the public records request you submitted to King County for the percentage of ACCESS users who were picked up to be dropped off at a bus stop for the year 2016. King County Department of Transportation (KCDOT) Metro Transit ACCESS staff ran a query on ACCESS clients who were dropped off at Metro Zones (coded “MZ”) on their trips database. The drop-offs do not necessary represent clients who were dropped off at a MZ to catch a fixed-route bus; rather, MZ drop-offs generally reflect situations where clients were dropped off near their intended destination at a MZ due to a lack of other available safe drop off locations in the area. ACCESS reports that according to their query results, in 2016, there were a total of 875,350 ACCESS trips delivered and of those, 16,095 (or 1.8%) of trips were reported as MZ drop offs. 10,391 ACCESS clients utilized the service in 2016 and of those, 1,516 (or 14.6%) were dropped off at a MZ on at least one trip over the course of the year. The information above was compiled in specific response to your request. This got us thinking. Surely, if there are so many others like myself just needing rides to a bus stop, there should be a more efficient way of approaching this. Metro Access reports in their rider guide that “an average Access trip costs $48. An average bus trip costs $4. Fares pay a portion, but local taxpayers pick up most of the cost.” That means that for the 1,516 people who took those trips, it would cost the county approximately $72,800 in Access services using their figure of $48/trip. I’m not a policymaker or too familiar with budgeting for a county, but it seems to me that there could be other ways of providing that kind of service without spending that much money. Metro already provides subsidized taxi service through a program called TaxiScrip, but some of the same flaws that are present with Access such as uncertainty in pickup make it a less appealing option. Plus, it is incredibly expensive to regularly ride a taxi. One cheaper option that comes to mind is using services such as Uber or Lyft in conjunction with regular transit. Now we don’t know if all of these riders can use these services, but for ones that currently do anyway, I could see immense savings for riders, Metro Access, the county, and taxpayers if there was a way to incorporate these services into the public transit system. Sound farfetched? Actually, there are trials of this exact idea happening right now in Boston. First introduced in fall 2016, the On Demand Paratransit program in Boston aims to subsidize paratransit costs and make the process more efficient for riders by allowing people to use Uber or Lyft for rides. Riders pay $2 to start, and Boston transit, MBTA, pays up to $15. If a rider were to take a trip that cost more than $17, the rider pays the rest. So, a $25 trip would cost the rider only $10. If I’m basing these numbers on what I know in the Seattle area, you can go pretty far before you would need to pay extra. For example, having made the trip before, I know I could go from my front door, with a passenger, during commuting hours to Downtown Seattle. I could also run the assortment of boring errands one takes around town for the $2. This would be a tremendous savings and convenience for someone like me. Programs like this allow disabled people to have more independence, and from a cost perspective, benefit all sides. Riders get peace of mind that their ride will show up when it is supposed to and it costs less than the traditional paratransit and using these services out right. Naturally, transit agencies have to be thrilled at lowering their bills, which in essence means that taxpayers have lower bills as well. The program started out with a group of 400 riders, and by February 2017, was expanding to all paratransit eligible customers in Boston. The MBTA reports an 18% reduction in the more expensive traditional paratransit, and a savings of at least $40,000. Even with all the benefits, there are challenges that must be addressed before this type of program can realistically be implemented in other places. I’m aware that some disability advocates, including myself, have complained about the relationship between Uber/Lyft and people with disabilities. I’ve had experiences where I wasn’t able to be picked up (once in years), have struggled to climb into vehicles that were too tall, and certainly have seen the stories about issues with disability and Uber or Lyft. I’m not trying to argue that it’s a perfect solution to subsidize paratransit this way, because it’s not, but it would be nice to have the option. For it to be truly viable long term, Uber and Lyft would need to do some education with its drivers, and maybe reconfigure some policies particularly around issues like service dogs. However, I don’t see how what has been done in Boston cannot be replicated around the country. Obviously I’m biased, but it would be wonderful to see this here in Seattle. I believe it could easily start with riders who are in my situation; shorter trips and users who don’t have constraints like service dogs or mobility devices that cannot fold. As the outstanding and well-documented challenges with Uber and Lyft are met, the programs could expand to serve more disabled clients. This is obviously just one perspective, and one of many issues, within the idea of transportation and disability. It is interesting to see what is happening in other metro areas and to wonder if that could work here. As I was writing this, it occurred to me that I have unanswered questions about this issue that I could possibly use to help bring something like this to Seattle. I am considering doing some research and more gathering of data, and writing a follow up about what I discover. I’d love to hear your thoughts.